1497. Vasco da Gama was charged with finding a maritime route to India. Players play the part of rich shipowners who aim to achieve prestige and riches. To succeed in the enterprise, they must manage the money and actions at their disposal in order to hire captains, recruit crew, build Ships, launch them and send them. For each Ship sent, players will receive an immediate reward and will gain prestige (Victory Points). The further the Ship is sent, the lower the compensation, but the higher the victory score that the Player will earn. Planning is fundamental: The right to take an Action could be free of charge or paid for. Players will then have to ask themselves if and how much they are ready to pay for the right to act first in a certain area. This is a worker placement game at its best! a Purchase Projects Area where you buy the ships for your expeditions. A Characters Area where you can make use of the special abilities of the four characters in the game. You select these areas by placing a token numbered 1 to 22 into the area you want. The number on the token is the order that the actions are carried out in, but the twist is that a certain number of the low value tokens will cost money to use the action, and if you can't pay for its use you cannot perform the action. 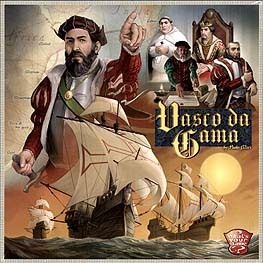 Vasco da Gama uses a set of actions that combine cleverly with each other. So you need to plan out a series of actions by using the numbers. You need to buy a ship before sending it to the sea, but you need the crew to launch it and a captain to guide it. And don't forget the funds you may have to spend for the action at the moment you have to take it. A very entertaining worker placement and management game.